The 4-bed dorm room, aka the “cave room” is located on the basement level. The cave room has 4 western style beds, each with a comfy full-size mattress for a great night’s sleep. With our ridiculously comfortable, hotel grade pillows, you’ll be dreaming about the pillows you’ll be smashing on the slopes! 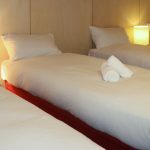 We provide fresh, clean linen, pillow and duvet. There are separate girls and boys toilets and bathrooms with shampoo, conditioner and body soap provided.